Red Bank Flavour, a culinary campaign driven by the borough’s top chefs, restaurateurs and proprietors, will tempt foodies to flirt with their senses this holiday season at the second-annual Holiday Flavour event. 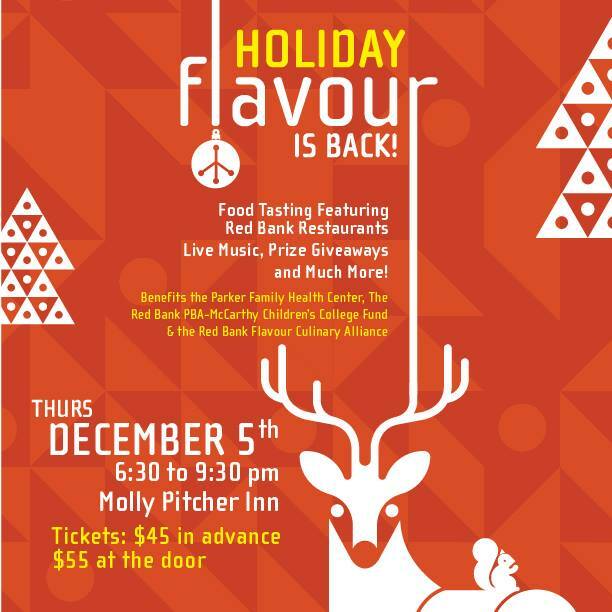 Slated for December 5, 2013 at The Molly Pitcher Inn, Holiday Flavour will feature more than twenty of the town’s most-popular restaurants and eateries at an exquisite culinary affair. A portion of the evening’s proceeds will benefit The Parker Family Health Center, Red Bank PBA Local 39’s McCarthy’s Children Fund and the Red Bank Flavour Culinary Alliance. This year, in addition to the wonderful samplings from Red Bank eateries, foodies will have a chance to win a special, multi-course tasting menu, curated by award-winning Chef Tom Colicchio, with wine pairings for two in the Main Dining Room at Colicchio & Sons. “Holiday Flavour is yet another occasion to bring our community together in celebration of Red Bank’s culture and cuisine, while also raising awareness for non-profit organizations that support our local community. As members of the hospitality industry, we all are very excited to welcome gourmands from around the region to celebrate the season while giving back to two very important non-profit entities,” commented Valerie Aufiero of Red Bank’s Front Street Trattoria. Hosted in The Molly Pitcher Inn’s beautiful ballrooms overlooking the Navesink, Holiday Flavour will invite guests to sip and sample a palatable array of cuisine and cocktails. The charitable evening will include live music, a tree lighting, carolers and a fabulous winter wonderland on the hotel’s beautiful, waterfront promenade. Additionally, a charity grab-bag and outdoor hot chocolate bar, compliments of the Red Bank Starbucks, will be offered to guests. Holiday Flavour will take place from 6:30 to 9:30 p.m. on Thursday, December 5. Tickets for the event are $45.00 in advance and $55.00 at the door. For more information, or to purchase tickets, please visit www.RedBankFlavour.com. Launched in the fall of 2011, Red Bank Flavour is a culinary-driven campaign that spotlights Red Bank’s bustling restaurant, bars, lounges and eateries. It encourages everyone from bar and restaurant-goers, foodies, wine enthusiasts and farmers market fans to get a taste of Red Bank’s one-of-a-kind Flavour. The campaign will feature nightly specials and promotions, special events, a Flavour Club and more. For additional information, please visit www.RedBankFlavour.com.